All In Entertainment Presents: Hometown Takeover! 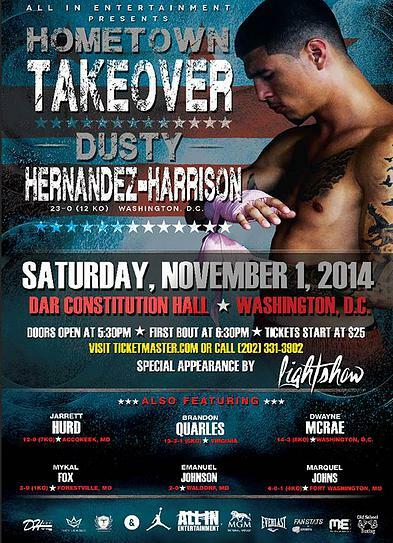 On Saturday, November 1, 2014 Dusty Hernandez-Harrison returns to the ring to face Michael Clark. Dusty was a late scratch in his last fight due to injury, but he’s all set to go in this hometown matchup. The card will take place at DAR Constitution Hall and is sponsored by All In Entertainment. Hernandez-Harrison, 23-0 (12 KOs) last fought in July at Madison Square Garden and earned a hard fought eight round decision over Wilfredo Acuna. He continues a busy 2014 as this will be his 5th fight this year. Clark has been in the ring with some pretty big names. Among them are former IBF World lightweight champion Leavander Johnson, former WBC and WBA light welterweight champion Vivian Harris, and former IBF light middleweight champion Cornelius “K9” Bundgrage to name a few. This should shape up to very a very nice test for Hernandez-Harrison. Even though the 41 year old Clark has been stopped in his last three fights, the level of competition has been strong. Also on the card are local up and coming talents Jarrett Hurd, 12-0 (7 KOs) and the young lightweight out of Forestville Mykal Fox, 3-0. In addtion to these Maryland prospects, we have other DMV representatives (Alexandria) Brandon Quarles, 13-3 (5 KOs), (Laurel) heavyweight Dwayne McRae, 14-3 (8KOs), and Marquel Johns (Ft. washington, via Philly) Marquel “Monster” Johns 4-0-1 (4 KOs). Also slated to make a special appearance will be Washington, DC rap music artist LIGHTSHOW. Previous Golovkin and Walters score impressive KOs!